The perfect Religious Party Favor for your Child's Blessed Event. 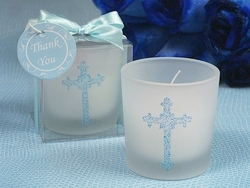 These frosted glass votive Blue Cross Candle Holders are accented with a beautiful Cross design in blue glitter and comes with a white votive candle. Whether your having a First Holy Communion, Confirmation, Christening, Baptism or any other religious event, these pretty Candle Holders are sure to be a hit with your guests. All ready to hand out to you guests, these Candle Holders come in a clear gift box adorned with a blue satin ribbon and a thank you tag!